The whole week has generally pumped the fresher with all types of information. The week that culminated into Uganda getting a new beauty queen begun with the reporting of freshers in all universities, but the pace was set by a one “Catherine Nalumyanso”. All this time, the Kyambogo parody account (@KyambogoUni) was carefully watching, and did cook up a perfect response as you can see. Nalumyanso Catherine was introduced to the world. In a spell of 20 minutes, the tables flipped so quickly. The girl, whose real name we may never get to know is somewhere silent, albeit ruing her decision to be so brutally honest. The timeline is indeed not for the weak, so beware not to say what you can’t defend. The real reason for the TV show though had been to seek public opinion on the different universities that the freshers were going to join. 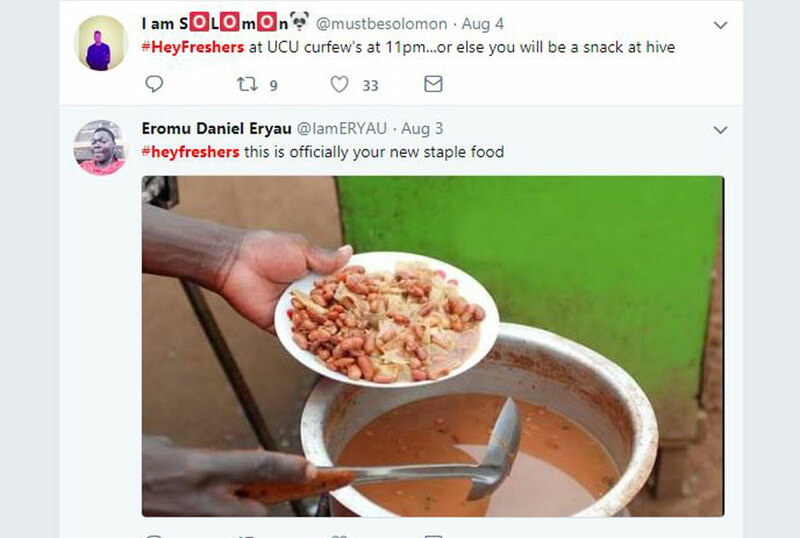 Twitter was kind enough to set up the #HeyFreshers hashtag, to give quick tips and life hacks on how to sail through campus. From tips on what company to keep, academic excellence, where to find the cheaper clothes, sexual and reproductive health to maintaining a good relationship with the rolex guy, twitter almost covered it. The genuine cause was even bettered when tweeps decided they would rather hinge on the outstanding characteristics of freshers to drive the point home. Freshers : “No way I can fail to get 50%. Howww? They are selling handouts in the next room. Amidst all this jest, it was really relieving that people, consciously or otherwise, could provide a starter pack to a new group getting into arguably the most thrilling stage of education, and we wish them the best of luck. Elsewhere, Miss Uganda 2018 came to a glorified ending, with Quin Abenakyo taking the crown home. Thanks to #MissUg18. However, there were some members of the public, like @peruthvanessa here, who believed they held a higher opinion than the judges. The laissez faire attitude of Ugandans was for once rebuked well with evidence even. While we were being lazy here, someone else was doing our job. That aside though, it was pleasant to see the glitz and glamour flashed well all over the timeline. If you missed the event, spare a minute and pass by the hashtag and get yourself an insight. That’s it for now folks, let’s prepare for another super 7 days. Remember to keep watching your back, because if you don’t someone will…but then again, its twitter. Its never that serious.